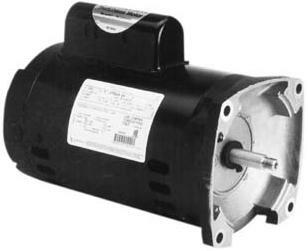 Backyard City carries a variety of replacement pump motors for your pool. We sell motors manufactured by A.O. Smith which is the first name in replacement motors. These motors are made to fit pumps made by any major pool pump manufacturer including Hayward, Pentair, Sta-rite, Jandy, and Jacuzzi. It is very important to purchase the correct motor to fit your pump. The manufacturer's part number on the label of a pump or motor is the best way to find the right replacement motor. If you are not sure which motor is correct, we recommend that you seek professional assistance. It is also very important to follow the installation instructions without error. Installation errors can cause irreversible damage to a motor. The B852 is a 3/4 horsepower motor with a 1.25 service factor and 3600 rpm. It is 230/115v with a 56Y frame and a square flange. It is a single phase motor. 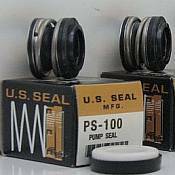 PLEASE NOTE: The motor seal MUST be replaced along with the motor, because installing a replacement motor with an old pump can cause the pump to leak which can lead to a variety of problems. ATTENTION: Improperly wiring a motor will cause irreversible damage. If the motor runs slowly then trips out, it is incorrectly wired. Please carefully read the motor name plate regarding the connections. 115/230 volt motors are shipped from the factory connected for 230 volts. A motor connected for 115 volts that has 230 volts applied will burn up immediately. A motor connected for 230 volts that has 115 volts applied will run slowly and trip out. If the wires moved on the connection board are not replaced on the proper terminals, the result will be a slow running motor that overheats and trips out. These motors have automatic overload protection, which means the motor will not run again until it cools down. If you are experiencing problems, please recheck the connections to insure you have the motor properly wired for the incoming voltage. These motors have been test run at the factory, and they very rarely have problems. Problems are almost always related to improper wiring or other installation issues. Please be sure that you are ordering the correct motor and that follow all installation instructions carefully to avoid the hassle of sending back a burnt up motor.